Honoré Daumier was a French lithographer who over the course of his lifetime drew over 4,000 lithographs. These lithographs were mainly satirical, and appeared in his French satirical newspaper, La Caricature. Daumier enjoyed criticizing the French government, and also the members of legal professions (judges, attorneys, etc.). One of his lithographs, Hippophagia (1857), gathered a lot of backlash because it advocated for the consumption of horsemeat. At the time of its publication, France was trenched in social disorder and chaos. The government had still not recovered from its monarchial overthrow during the French Revolution of 1789, and with the Industrial Revolution making fast changes to Europe, France struggled to keep up. Instead of becoming a successful empire like Britain, France experienced long bouts of starvation, leading France’s impoverished social class to buy horse meat because of its vast availability and cheap prices. However, though horse meat was not a taboo in France, the consumption of horse meat is a taboo elsewhere around the world. Daumier’s lithograph demonstrates that horse meat is edible, and should not be condemned otherwise. Many critics of horse meat complain that it is too tough, but that is generally due to the meat being overcooked. Instead, one should look at the health benefits of horse meat—it is high in caloric value and in protein. 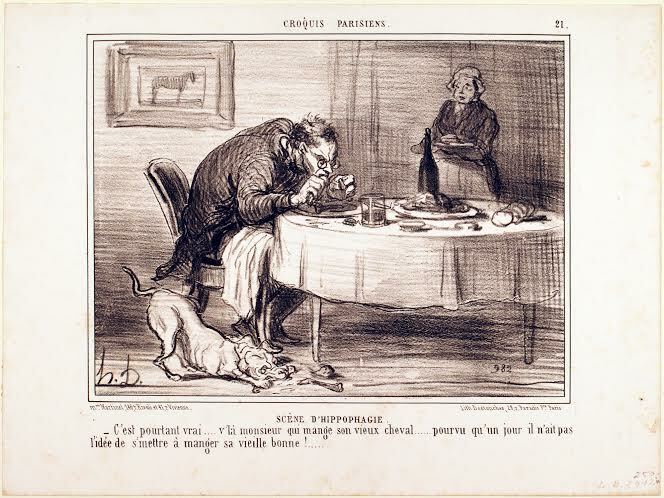 Originally a critique of the French government, Daumier’s lithograph can also be portrayed as his argument for the consumption of horse meat.